InicioTOEFLAn introduction to the TOEFL reading section of the ibt Test lesson 1. 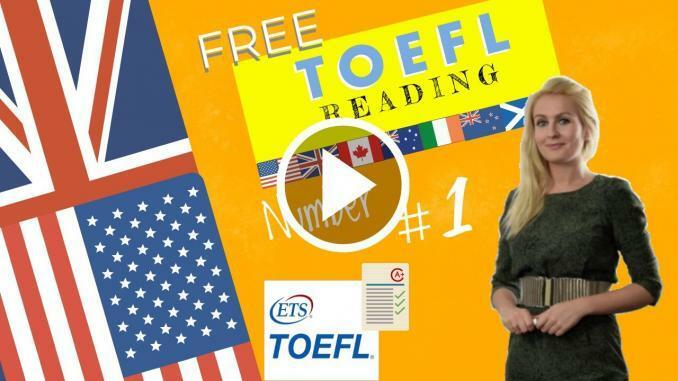 In this introduction to the toefl reading section of the ibt TOEFL Test we will explain the exact nature and format of the exam before starting the preparation. This section will test your ability to skim text for key facts and important information, ask well as to understand various relationships between ideas, and to make inferences about an author’s opinion. The toefl reading section tests your Academic Reading Skills. The Reading section measures your ability to understand and interpret under graduate-level academic texts and passages. In order to study in an English speaking country or in a study program that is taught in English you are expected to read and understand information from textbooks and other academic materials that are written in English. Recognizing the organization and purpose of a passage. Organizing information into a category chart or a summary in order to recall major points and important details. Inferring how ideas connect throughout the passage. The toefl iBT Reading section includes three to five reading passages. There are 12 to 14 questions per passage. You have 60 to 100 minutes to answer all the questions in the section. TOEFL Reading passages are excerpts from college textbooks that would be used in introductions to a discipline or topic. The excerpts are changed as little as possible because the goal of the TOEFL iBT test is to assess how well you can read the kind of writing that is used in an academic environment. The passages will cover a variety of different subjects. You don’t need to be familiar with the topic of a passage. All the information you need to answer the questions will be in the passage itself. Often passages present information about the topic from more than one perspective or point of view. This is something you should note as you read because you’ll usually be asked at least one question that allows you to show that you have understood the general organization of the passage. You must read through or scroll to the end of each passage before receiving questions on that passage. Once the questions come up on the screen, the passage appears on the right side of the computer screen. The questions are on the left. Questions with four choices but a single answer in traditional multiple-choice format. Questions with four choices and a single answer that ask you to “insert a sentence” where it fits best in a passage. “Reading to learn” questions with more than four choices and more than one possible correct answer. Each passage is accompanied by a “reading to learn” question. These questions test your ability to recognize how the passage is organized and to understand the relationships among facts and ideas in different parts of the passage. For these questions, you’re asked to sort information and place the text options provided into a category chart or summary. The summary questions are worth up to two points each. The chart questions are worth up to three points if there are five options presented, and up to four points if there are seven options presented. You can improve your reading skills in English by reading regularly, especially university textbooks or other materials that cover a variety of subject areas—such as sciences, social sciences, arts, business— and are written in an academic style. The Internet is one of the best resources for reading material, but books, magazines or journals of any kind are very helpful as well. It’s best to include material that is more academic in style, the kind that would be found in university courses. Reading as much as possible in English is an essential part of building your reading skills. Reading and listening at the same time will make the experience much more beneficial. Watch our TOEFL Vocabulary videos,which contain word lists and flash-cards to review the words frequently. – Learn to recognize the meanings of prefixes, suffixes and common roots of words. Look for the main ideas and the relevant details and note the relationship between them. Notice how the end of one sentence is related to the beginning of the next sentence. Make a list of the important points of the passage and then write a summary of them. If the text is a comparison, be sure your summary shows that. If the text puts forward two points of view, make sure both are reflected in your summary. Find a companion or do an online class with us to help improve your reading skills. You read an article out loud from a journal or magazine ask them to correct you. Basic information questions (who, what, where, when, how and why) are very helpful. Read a Reading passage out loud from The Official Guide to the TOEFL® Test or from any academic text. Think about the main idea of each paragraph and then write a “heading” for each paragraph. The “heading” should be short (five to eight words) and it should convey the main idea of the paragraph. Then write a five- to six sentence summary of each passage. Do not forget that the toefl reading section is worth 30 points out of a possible 120. Cut up a newspaper or a photocopy of an academic text into paragraphs and then try to put the text back together in the original order. Look out for words that give you clues about the ordering of the paragraphs to help you put the text back together again . Work on increasing your reading speed. This can be done by timing yourself as you read. Practice makes perfect, look at our many videos and improve your listening at the same time. Read a short text (article or short reading from a text) once and record the time it takes you to read it. Then read it again and try to improve your reading speed. Join a book club and discuss books in each meeting. Write a synopsis of teach texts or book you read. Summarizing skills will not help you with the TOEFL iBT Reading section but learning to summarize reading passages will help you on the Speaking and Writing sections. Practice Scanning passages to find and highlight key facts, such as: dates, numbers, definitions and information. Look for capital letters, numbers and symbols, and special formatting (such as italics) as you are scanning. Look out for words in a passage that have the same meaning. Highlight each one with a marker pen. Then look at how the writer used these words with similar meanings. Targeted Activities Reading for Basic Comprehension. Practice skimming a passage quickly to get a general impression of the main idea instead of carefully reading each word and each sentence. Practice reading the introductory paragraph, the first sentences of paragraphs and the concluding paragraph to get the gist of a passage. Develop the ability to skim quickly and identify major points. After skimming a passage, read it again more carefully and write down the main idea, major points and important facts. Choose some unfamiliar words in a passage and guess the meaning from the context (surrounding sentences). Then look the words up to confirm their meaning. Underline all pronouns (for example: he, him, they, them, etc.) and identify the nouns to which they refer in the passage. Paraphrase individual sentences in a passage. Then paraphrase entire paragraphs. Adapted Activities Reading to Learn. Whenever you read, identify the passage type (cause/effect, compare/contrast, classification, problem/solution, description, narration). Make a list of the major points of the passage and the minor points that support them. – If the passage categorizes information, create a chart and place the information in appropriate categories. Create an oral or written summary of the passage using the charts, lists and outlines. These sample questions in the Reading section measure your ability to understand academic passages in English. You will read one passage and answer questions about it. In a real test, you would have 20 minutes to read the passage and answer the questions. Candidates with disabilities may request a time extension. La sección Reading mide tu capacidad para comprender e interpretar textos y pasajes académicos del nivel de posgrado. Para estudiar en un país de habla inglesa o en un programa de estudio que se imparte en inglés, se espera que leas y comprendas información de libros de texto y otros materiales académicos escritos en inglés. Un entendimiento del tema general o idea principal, puntos principales, hechos y detalles importantes, vocabulario en contexto y uso de pronombres. Reconociendo la organización y el propósito de un pasaje. Comprender las relaciones entre ideas. Organizar la información en un cuadro de categorías o un resumen para recordar los puntos principales y los detalles importantes. Inferir cómo las ideas se conectan a lo largo del pasaje. Descripción de la sección de lectura. La sección Lectura de TOEFL iBT incluye de tres a cinco pasajes de lectura. Hay de 12 a 14 preguntas por pasaje. Tienes de 60 a 100 minutos para responder todas las preguntas de la sección. Los pasajes de lectura TOEFL son extractos de los libros de texto universitarios que se utilizarán en las introducciones a una disciplina o tema. Los extractos se cambian lo menos posible porque el objetivo de la prueba TOEFL iBT es evaluar la capacidad para leer el tipo de escritura que se utiliza en un entorno académico. Los pasajes cubrirán una variedad de temas diferentes. No necesitas estar familiarizado con el tema de un pasaje. Toda la información que necesitas para responder las preguntas estará en el mismo pasaje. A menudo, los pasajes presentan información sobre el tema desde más de una perspectiva o punto de vista. Esto es algo que deberías notar mientras lees porque normalmente te harán al menos una pregunta que te permita demostrar que has entendido la organización general del pasaje. Debes leer o desplazarte hasta el final de cada pasaje antes de recibir preguntas sobre ese pasaje. Una vez que las preguntas aparecen en la pantalla, el pasaje aparece en el lado derecho de la pantalla del ordenador. Las preguntas están a la izquierda. Formatos de las Preguntas de Lectura. Preguntas con cuatro opciones pero una sola respuesta en el formato tradicional de opción múltiple. Preguntas con cuatro opciones y una sola respuesta que te piden que “insertes una oración”, donde se ajusta mejor a un pasaje. Preguntas de “Leer para aprender” con más de cuatro opciones y más de una posible respuesta correcta. Cada pasaje está acompañado por una pregunta “Leer para aprender”. Estas preguntas ponen a prueba tu capacidad para reconocer cómo se organiza el pasaje y comprender las relaciones entre hechos e ideas en diferentes partes del pasaje. Para estas preguntas, se te pedirá que ordenes la información y coloques las opciones de texto proporcionadas en un cuadro de categoría o resumen. Las preguntas sobre resúmenes valen hasta dos puntos cada una. Las preguntas del cuadro tienen un valor de hasta tres puntos si se presentan cinco opciones, y hasta cuatro puntos si se presentan siete opciones. Práctica de habilidades de lectura. Puedes mejorar tus habilidades de lectura en inglés leyendo con regularidad, especialmente libros de texto universitarios u otros materiales que cubren una variedad de áreas temáticas, tales como ciencias, ciencias sociales, artes, negocios, y que están escritos en un estilo académico. Internet es uno de los mejores recursos para leer material, pero libros, revistas o diarios de cualquier tipo son muy útiles también. Lo mejor es incluir material que sea más académico en estilo, del tipo que se encontraría en los cursos universitarios. Leer tanto como sea posible en inglés es una parte esencial para desarrollar tus habilidades de lectura. Leer y escuchar al mismo tiempo hará que la experiencia sea mucho más beneficiosa. Mira nuestros vídeos de vocabulario de TOEFL, que contienen listas de palabras y tarjetas de memoria para revisar las palabras con frecuencia. – Aprender a reconocer los significados de los prefijos, sufijos y raíces comunes de las palabras. Busca las ideas principales y los detalles relevantes y observa la relación entre ellos. Observa cómo el final de una oración está relacionado con el comienzo de la siguiente oración. Haz una lista de los puntos importantes del pasaje y luego escribe un resumen de ellos. Si el texto es una comparación, asegúrate de que tu resumen muestre eso. Si el texto presenta dos puntos de vista, asegúrate de que ambos se reflejen en tu resumen. Encuentra un compañero o haz una clase en línea con nosotros para ayudarte a mejorar tus habilidades de lectura. Lee un artículo en voz alta de un diario o revista y pide que lo corrija. Las preguntas de información básica (quién, qué, dónde, cuándo, cómo y por qué) son muy útiles. Lee un pasaje de Reading en voz alta de The Official Guide to the TOEFL® Test o de cualquier texto académico. Piensa en la idea principal de cada párrafo y luego escribe un “encabezado” para cada párrafo. El “encabezado” debe ser corto (de cinco a ocho palabras) y debe transmitir la idea principal del párrafo. Luego, escribe un resumen de cinco a seis oraciones de cada pasaje. Recorta un periódico o una fotocopia de un texto académico en párrafos y luego intenta volver a juntar el texto en el orden original. Busca palabras que te brinden pistas sobre el orden de los párrafos para ayudarte a volver a juntar el texto en orden. Trabaja para aumentar tu velocidad de lectura. Esto se puede hacer cronometrando a medida que lees. La práctica hace al maestro, mira nuestros muchos vídeos y mejora tu escucha al mismo tiempo. Lee un texto breve (artículo o breve lectura de un texto) una vez y registra el tiempo que te lleva leerlo. Luego léelo de nuevo y trata de mejorar tu velocidad de lectura. Únete a un club de lectura y discute libros en cada reunión. Escribe una sinopsis de textos de enseñanza o libros que lees. Resumir las habilidades no te ayudará con la sección Lectura de TOEFL iBT, pero aprender a resumir los pasajes te ayudará en las secciones de Habla y Escritura. Practica escaneando pasajes para buscar y resaltar hechos clave, como fechas, números, definiciones e información. Busca letras mayúsculas, números y símbolos, y un formato especial (como cursivas) mientras escaneas. Busca las palabras en un pasaje que tengan el mismo significado. Resalta cada uno con un rotulador. Luego mira cómo el escritor usó estas palabras con significados similares. Actividades específicas Lectura para comprensión básica. Practica ojeando un pasaje rápidamente para obtener una impresión general de la idea principal en lugar de leer cuidadosamente cada palabra y cada oración. Practica leer el párrafo introductorio, las primeras oraciones de los párrafos y el párrafo final para obtener la esencia de un pasaje. Desarrolla la capacidad de examinar rápidamente e identificar los puntos principales. Después de leer un pasaje, vuelve a leerlo con más atención y anota la idea principal, los puntos principales y los hechos importantes. Elije algunas palabras desconocidas en un pasaje y adivina el significado por el contexto (oraciones que lo rodean). Luego mira las palabras para confirmar su significado. Subraya todos los pronombres (por ejemplo: él, él, ellos, ellos, etc.) e identifica los nombres a los que se refieren en el pasaje. Parafrasea oraciones individuales en un pasaje. Luego, parafrasea párrafos enteros. Actividades adaptadas Leer para aprender. Siempre que leas, identifica el tipo de pasaje (causa / efecto, comparar / contrastar, clasificación, problema / solución, descripción, narración). Haz una lista de los puntos principales del pasaje y los puntos menores que los respaldan. – Si el pasaje categoriza información, crea un cuadro y coloca la información en las categorías apropiadas. Crea un resumen oral o escrito del pasaje usando los cuadros, listas y esquemas. Estas preguntas de muestra en la sección de Reading miden tu capacidad para comprender los pasajes académicos en inglés. Leerás un pasaje y responderás preguntas al respecto. En una prueba real, tendrías 20 minutos para leer el pasaje y responder las preguntas. Los candidatos con discapacidades pueden solicitar una extensión de tiempo.